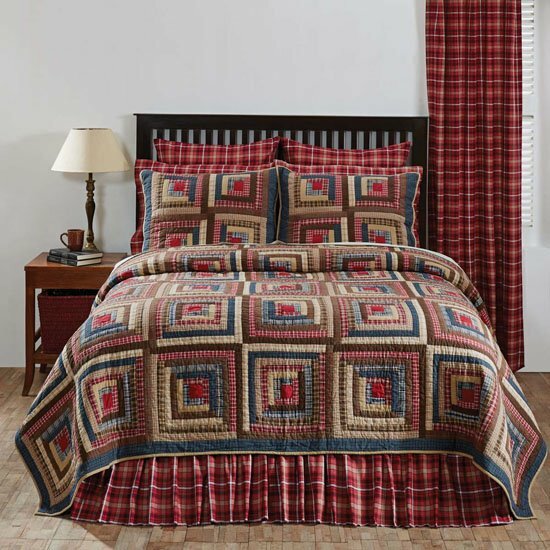 Braxton log cabin Quilt Bedding by VHC Brands | P.C. Fallon Co.
A new take on one of America’s most loved patchwork patterns, Braxton features log cabin squares in navy, apple red, and natural tones. The companion print is a handsome plaid in tones of apple red, natural and ebony. Braxton is a great choice for décor styles including Americana, new Farmhouse, rustic, lodge, cabin, primitive, patriotic, and country. Available pieces include quilts, standard shams, king shams, Euro shams, bedskirts, a variety of window treatments and a shower curtain. Machine stitched and hand-quilted. 100% cotton. Imported. Machine wash in cold water on gentle cycle. Braxton Scalloped Prairie Swag Set of 2 36"x36"
Braxton Scalloped Swag Set of 2 36"x36"
Braxton Scalloped Tier Set of 2 L24"xW36"
Braxton Scalloped Tier Set of 2 L36"xW36"
Braxton Scalloped Prairie Curtain Set of 2 63"x36"
Braxton Scalloped Short Panel Set of 2 63"x36"
Braxton Scalloped Panel Set of 2 84"x40"